Marmot minutes: Wake up marmots! It’s that time again! 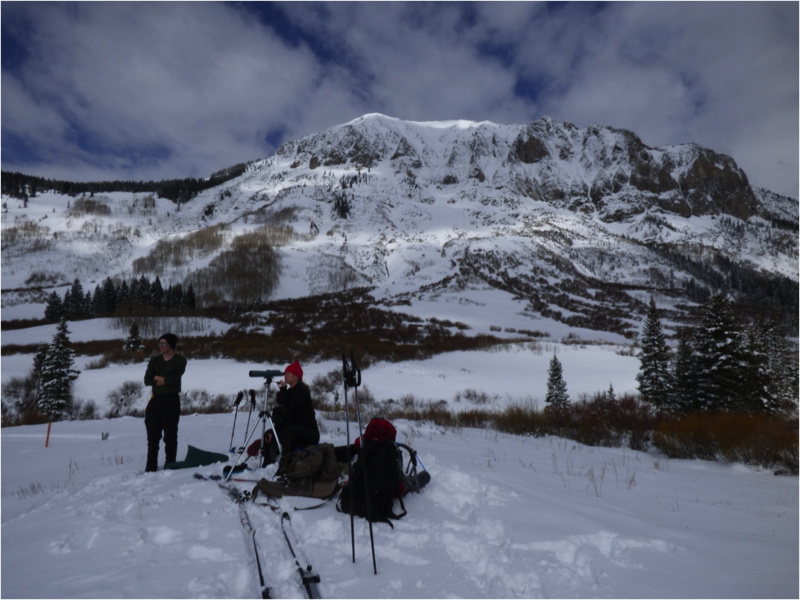 Last week, four of us early-season researchers skied 3.7 miles into our field station, the Rocky Mountain Biological Laboratory (RMBL), to record when the marmots emerge from hibernation. 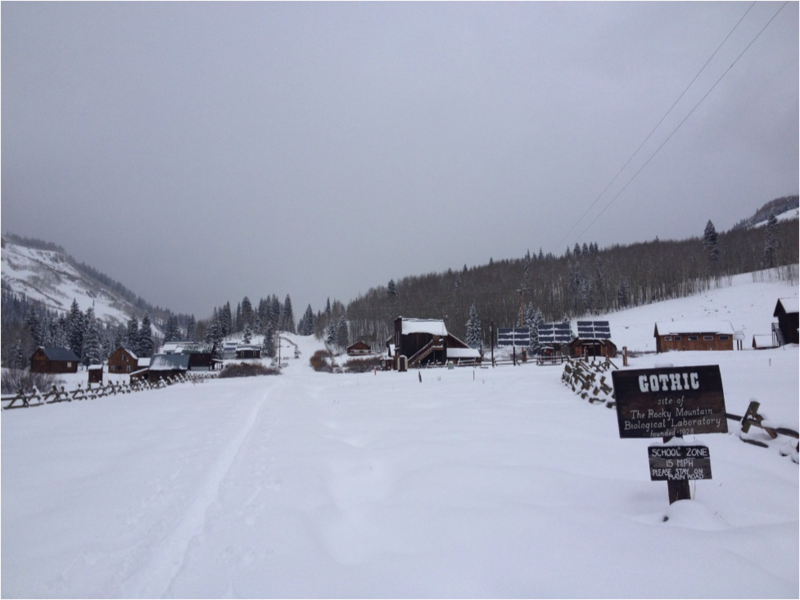 Although the weather over the last few weeks was showing signs for an early spring, we arrived to Colorado just as a huge storm rolled through, dropping up to 13 inches of fresh snow in just one day. The local residents (people and wildlife) of Gothic, Colorado were getting excited about the snow melting and temperatures increasing, but it turns out that Punxsutawney Phil may have predicted correctly: winter may not be over quite yet! As a first-time early-seasoner coming from sunny Los Angeles, I’m pretty excited that the snow is still here and we get to ski around for a while. Yesterday we went up valley to one of our field sites and, using our spotting scopes, we detected 4 yearlings and 2 adults out and about in the snow! One of the yearling marmots, referred to as “Danger” since it has a fur mark of a warning sign, seemed especially excited to run around in the snow and refused to follow her siblings back into the burrow when it started to snow again (I guess the “Danger” fur mark was appropriate)! But researchers aren’t the only ones keeping an eye out for marmots… there are a variety of predators in the valley too! Yesterday morning, we saw a hawk circling the field site we were observing. 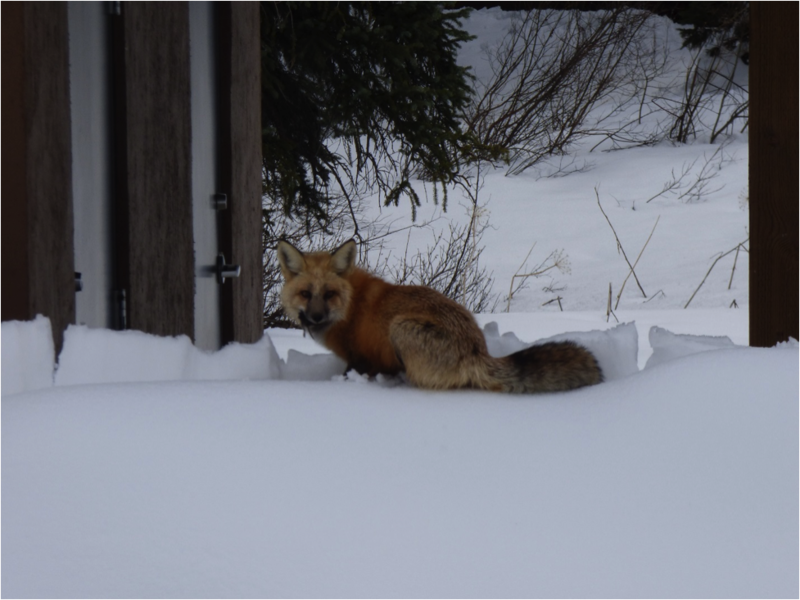 Then, in the afternoon, one of our team members spotted a red fox hanging out near our cabin. After exploring the area for a while, the fox suddenly darted across the road and up onto a huge snow pile. After a few seconds of digging, we realized it was uncovering a secret stash of mice! It munched out on a couple mice right in front of us, and then continued on its way. Who knew that the snow outside our cabin was also a freezer for a fox’s meal?! No signs of woken marmots at our other field sites yet, but stay tuned for more updates!